I was born with an extremely fragile heart. not the type that would show up on a medical chart or physician's exam, but one that has sustained countless bruisings and brokenness since childhood. most of the fracture initiators never even knew it, as it should be. Still, i learned early on that i would likely receive no prescription nor remedy for this condition for the remainder of my life. and that's proved to be true. NEvertheless, I'm a lover of love and stand firm that it's worth the risk. even when it hurts. I love the six-string guitar and anything on two wheels. It's just something I was born with, an affinity that was neatly packaged in my DNA. And vinyl records. And wandering alone. Although I'm fairly social, I've been a loner since childhood. And something else I didn't understand until I was in my mid-40's: I've had a loneliness in my heart & soul and a sadness sometimes on Sundays for as long as I can remember. I began taking classical guitar lessons around age 8 from a nationally renowned Flamenco guitar player named Lauro Rico. He was a quiet man until he grabbed a guitar. Thunder & lightening in a bottle. I distinctly remember his flair for silk scarves tucked neatly into a ring around his neck and pulled to one side. And during my lessons he nearly always had a tiny piece of duct tape on his thumbnail. His patience with me I carry always. My parents had an eclectic array of vinyl records and my musical education was heavily influenced by those LP's and the local radio stations. Johnny Cash, The Ink Spots, Elvis, Vickie Carr, The Carpenters and Charlie Pride, to name a few. The New Christy Minstrels and the incomparable Chet Atkins. And this wonderful disk of whimsical ballads without an album jacket by John D. Loudermilk. I eventually began collecting the K-Tel compilations and fell in love with Motown artists. I couldn't possibly list them all, but on many nights I fell asleep to The Stylistics, The Temptations, The O'Jays, Al Greene, and of course The Spinners. The Jackson 5 and Jr. Walker & the All Stars. The Chi-Lites. And Smokey Robinson. Have mercy! What was a skinny white boy from Phoenix to do with all that beautiful soul electrifying his heart and no way to understand much less express it? While sorting out the angst of my teenage years, I'd sit alone in my room on the edge of my bed with a small portable turntable spinning Jim Croce records nearby, and began learning the intricate guitar fingerings from his songbook I'd purchased in 1974, the year after he died in a terrible plane crash. Later I'd learn that Jim, much like Elvis and Buddy Holly, was influenced heavily by the blues and black artists. And then I understood. 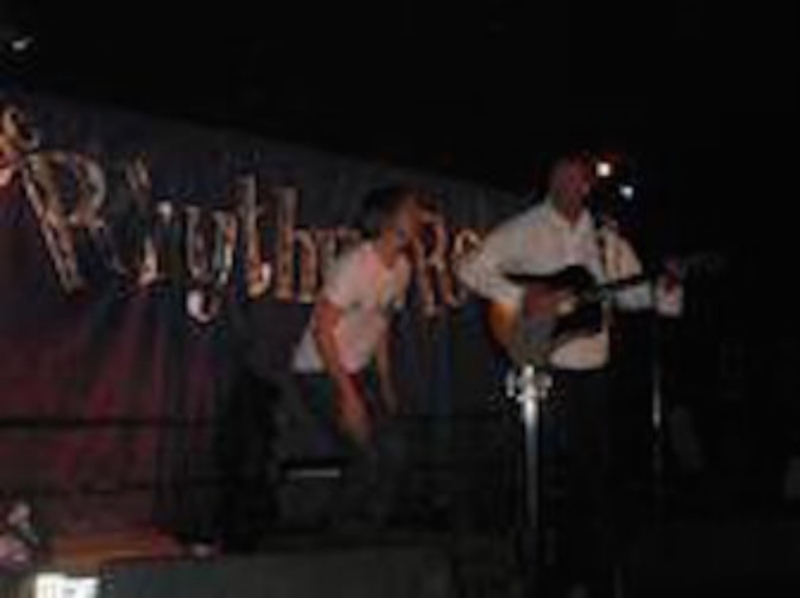 The first band I was part of was a trio named "The Three Fifths." My friends Jeff, Rick and me were in the fifth grade and our music teacher gave us that moniker. We'd play at school talent events and showcases, performing mostly Johnny Cash and Elvis covers. 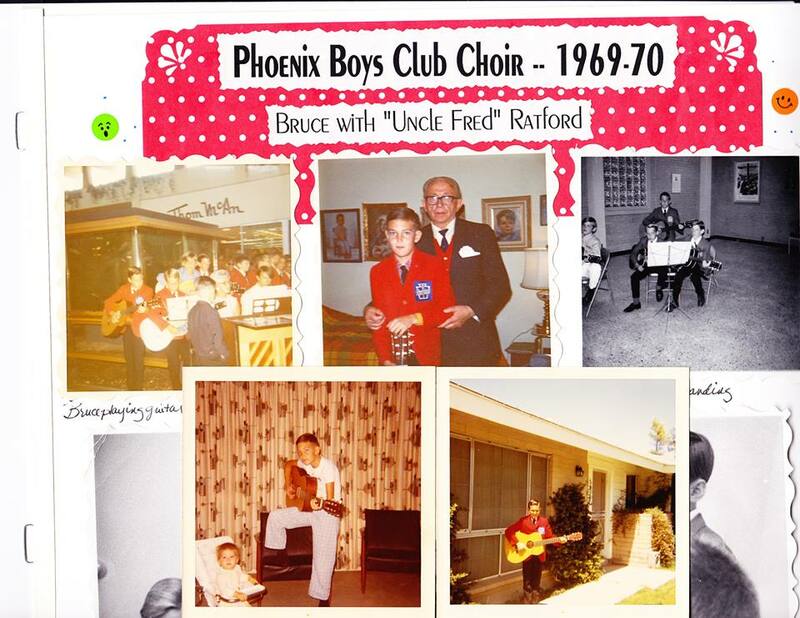 I played guitar and sang with the Phoenix Boys Club Choir, performing at shopping malls and Christmas events. I remember once coming home from school and being rushed to a local television station to play a live broadcast. Cool! During my high school years I sang in our church adult choir and with the youth group. Audrey, our pastor's wife, led both of those chorals and I'll always remember her saying to aim higher for a note in order to hit it. I still practice that vocal technique to this day and it really helps keep me on pitch. I played in a couple of garage bands while serving in the US Air Force and occasionally was part of a duo with my friend Ken. He played harmonica and we'd sing at one of the on-base clubs for beer and tips. I remember entering a base talent show with a guy named Bud, who was a terrific keyboard player and member of our garage band, "Undercover." We took second to an instrumental duo (after 30 years I still think we were better) and one of the comments we received was, "Are you guys mad at each other?" Bud and I were at almost opposite sides of the stage and I learned something about performance presentation from that experience. Then I left the service and got married, raised a family, and like most folks just worked. It's the way of things and I would only occasionally pick up my acoustic guitar just to make certain I didn't completely lose my playing ability. That never happened and the guitar has been a divine gift, seeing me through the ups & downs of life, providing an emotive spiritual communion that both confides and confirms that my life has a purpose. It's the one thing, that gift of wood and steel threads, that I know I'm here for. However good or not-so-good I may be, it's my destiny. I was itching to start performing again before I turned 40 and began somewhat irregularly hitting a few local coffee shops. Nearly four decades of living and a pocket full of favorite covers provided for a dialogue and connection with an audience in small venues I hadn't previously known. Then a co-worker named Julie handed me a CD from San Diego singer/songwriter Steve Poltz and my musical world was turned upside down in the best way. I'd never heard such whimsical and lovely tunes so cleverly crafted, and his stage presence is not easily described by his legion of fans. He's often referred to as "an experience." He once pulled me up on stage at the Rhythm Room to play a song together and it's my fondest memory. Steve's songs have formed the soundtrack for much of the last ten years of my life, and more than anyone he's taught me to let my freak flag fly, just be me on stage and connect with an audience. I consider myself a fortunate ambassador for this gifted troubadour! Just a few months into 2015 I was blessed to officiate the wedding of some dear friends in White Sands, NM. It would be several weeks before the reception back in Arizona and I wanted to make them something personal as a wedding gift. I found a photo of artwork someone made with sheet music and decided to use a musical score and lyrics that were meaningful to the couple. I'd never created anything in mixed media or any visual art and was metaphorically "flying blind", which is so much of my life these past few years. As I've learned, there are great forces at play, conspiring and benevolent, so I trusted and let it unfold. Shortly thereafter a friend suggested that I could probably make some money selling similar pieces. What?! So, I've learned a somewhat universal truth that repeatedly manifests in my life: never say never. Almost without fail, those things will show up in numbers. Whatever you resist, persists. And I'm grateful for that and am graciously learning to yield and move myself out of the way and not impede those forces paving my road ahead. I'm not perfect at it, but I hit more than I miss. I'm creating canvas art I never knew was possible, much less ever thought about. "I'm supposed to be a musician and recording my songs! I'm not an artist. What the hell is going on?!" I was way behind the timeline I'd given myself to release my music and couldn't make sense of this seeming delay in getting it done. My BFF Pam would remark, "God's timing is perfect. You're perfect. It's showing up exactly when and how it was supposed to." And then I remembered something. It took me about a month to process my first trip to Elvis Presley's Graceland. That was in 2013 and something happened that had nothing to do with rock n' roll. At first I described it as something spiritual following me back home, but later realized something within me had awakened. It took awhile, but I finally acquiesced and began to surrender to my calling. I'd left the corporate life to come home and embrace something new and magical, a spiritual journey expressed through mindful artistic living. It wasn't overnight, but somewhere along my path I started calling myself a singer/songwriter. A full-time musician. I began teaching guitar out of my home studio when there were students available. I got ordained so I could join couples in love and service while creating another avenue for my music. Somewhere along my journey I realized that I'd adopted a fairly constricted view of what an artistic life could look like. And that's what I'd come face-to-face with at Graceland: the enormity of what one life could be. The evidence was scattered throughout those sacred grounds. And all the records and movies and fame aside, that single life still resonates and echoes through the hearts of people worldwide. Even a life cut short can be lived fully and impact many. And so I realized that it was not in my best interest nor the interests of those brought into my life to limit my artistic expression or the forms in which it chooses to manifest. And that there is no delay where Divine timing is concerned. It's always perfect.